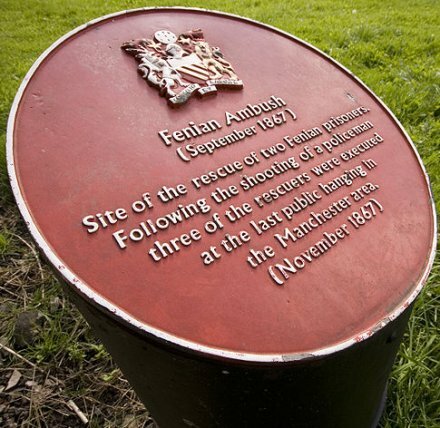 On this date in 1867, three Fenians hanged for the murder of a Manchester policeman. They were the Manchester Martyrs — Michael O’Brien, William Philip Allen and Michael Larkin. Two members of the Fenian organisation -– Kelly and Deasy –- were trapped in Manchester, and lay awaiting trial in an English prison. The Fenians in that city resolved to rescue them. [Manchester was a hotbed of Irish radicalism -ed.] This they did by stopping the prison van upon the road between Manchester and Salford, breaking open the van, shooting a policeman in the act, and carrying off their comrades under the very eyes of the English authorities. Marker on the spot of the ambush that started all the trouble. (cc) image from Tom Jeffs. Out of a number of men arrested for complicity in the deed, three were hanged. 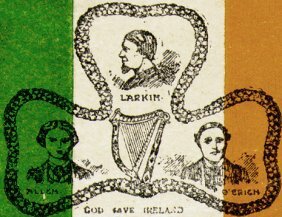 These three were ALLEN, LARKIN and O’BRIEN –- the three Manchester Martyrs whose memory we honour today. There were actually five in all selected to stand trial for their lives for what the British dubbed the “Manchester Outrage”; although all five were condemned to swing, one received clemency and a second was pardoned outright since the evidence against him was soon proven to have been entirely perjured. Indeed, all five of the men asserted their innocence in the shooting even when they acknowledged joining the crowd attempting to free their brethren. But they, and especially their partisans, were still more energetic asserting the Fenian cause from the platform afforded by the legal antechambers to the scaffold. 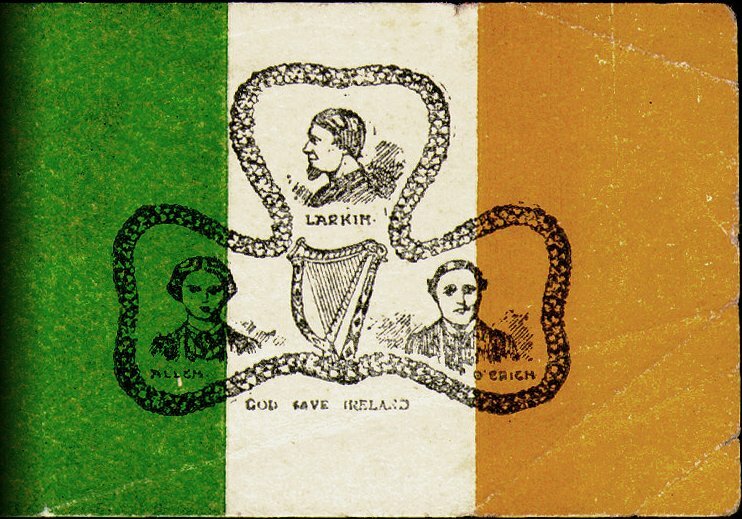 “God save Ireland!” they cried at several dramatic points in the trial — and these words titled a beloved patriotic tune in the martyrs’ honor. The British, basically, freaked at the effrontery of an Irish mob hijacking a police wagon, making Fenian as dirty a word among the Anglo respectable as terrorist is today, and stampeded the case to judgment without dithering overmuch about fine points like meticulous investigation. While respectable liberals could (and did) make the clemency case on grounds of actual innocence, the right-thinking were scandalized by Irish marches in overt support of Fenianism. So it was a bloodthirsty rabble, baying and not a little drunk, that gathered outside the walls of Manchester’s New Bailey Prison to see Allen, Larkin, and O’Brien hang** for their abominableness. This lot also happened to witness the last public hanging in Manchester; England shifted to private executions the next year. But these by no means represented everyone in Manchester. The very week of the Fenian ambush, a philosopher had dropped in to Manchester to visit a local industrialist. These were, granted, not Englishmen but Germans. Still, Karl Marx and Friedrich Engels were keenly interested in the Fenian cause. * Connolly was observing the anniversary of the men’s death in 1915, which was the same anniversary a 13-year-old Kevin Barry began his own path to future martyrdom by attending a Manchester Martyrs memorial. ** Hanged badly. Notoriously erratic hangman William Calcraft only killed Allen on the drop; descended the gallows to help Larkin along; and was denied access by O’Brien’s confessor, who said he held that strangling man’s hand full 45 minutes until he finally succumbed.